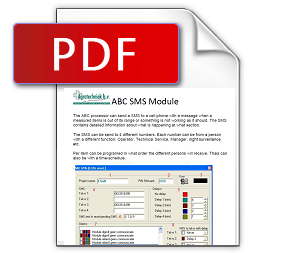 The ABC processor can send a SMS to a cell-phone with a message when a measured items is out of its range or something is not working as it should. The SMS contains detailed information about what is happening at what section. The SMS can be send to 4 different numbers. Each number can be from a person with a different function: Operator, Technical Service, Manager, night surveillance etc. Per item can be programed in what order the different persons will receive. Thais can also be with a time-schedule. Project name, which is entered. It will always be sent with an alarm sms so you know of which location it is sent. 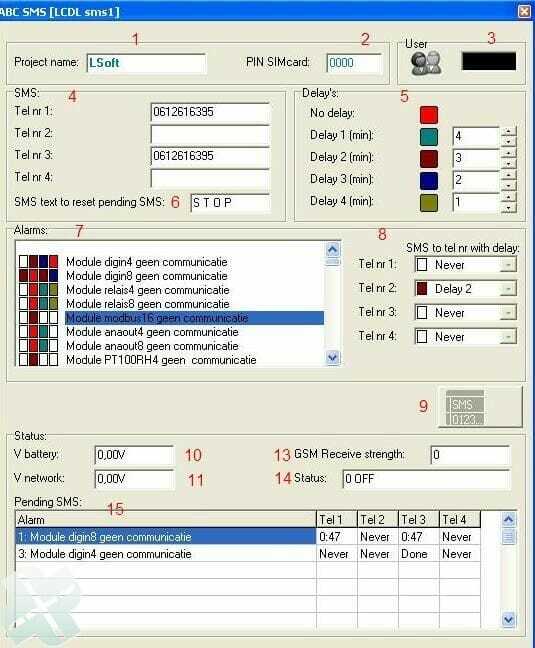 PIN code of the SIM card is inserted into the SMS module. User code to log in so you can make changes in the settings. List of phone numbers where messages can be send to. List of 4 different delays, with ‘brown’ after 3 minutes delay. Message which can be sent back by SMS alarm to confirm an alarm. Rows of blocks, each block represents a number (1/4 m). Block has a color to indicate whether and with what delay this number is called. List of all possible alarms on the ABC system. It is also possible to select multiple alarms at the same time, and then changing (copy). The properties of the whole selection at the same time. Settings for each alarm separately witch number receives an sms and whitwhat delay. Button to send the settings to the C-box. Status of the battery in the detector SMS. Status of the power supply in the SMS alarm. Displaying the signal strength of the GSM reciever. Current status of the actions performed by the SMS alarm. List of Messages that needs to be send with display of remaining time perphone number before the SMS is sent.